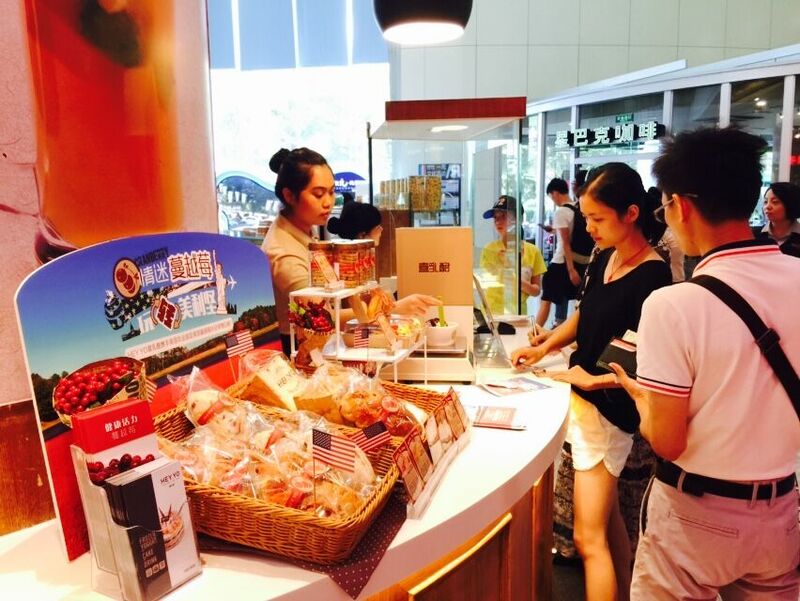 The promotion ran successfully in the whole month of August, starting on Aug 1st, and took place in 26 Hey_Yo outlets in Southern China, featuring nine new cranberry products developed by the chain. They included Cranberry Yogurt, Cranberry Croissant, Cranberry Cheese Bread, Cranberry Plait Bread, Cranberry Red Bean Bread, Cranberry Bread, Cranberry Toast, Cranberry Cake, and Cranberry Cracker. In addition, cranberries were used as toppings on frozen yogurt products. For every purchase of RMB 30 or more, the consumer got dried cranberry samples free and a chance to win prizes in a lucky draw, the grand prize being two round trip air-tickets to the USA, worth US$2100. During the promotion, the participating Hey_Yo outlets were decorated with U.S. Cranberry liveries. Each store hung U.S. flags and cranberry flags around the premise and organized special displays of cranberry products, while putting cranberry promotion stickers on counter tops, at the casher, and on tables. Video showing cranberries harvest was played continuously. The store assistants were thoroughly briefed on basic knowledge about cranberries before the event so they could feel at ease in telling their customers the Super Fruit’s many benefits. 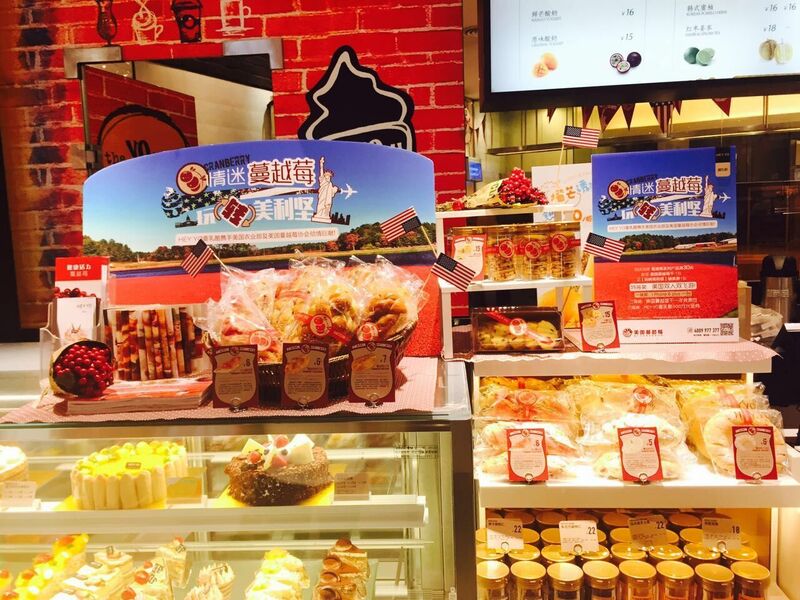 Social media – Wechat and Weibo, were used by both Hey_Yo and CMC to enhance consumers’ awareness of the promotion. This successful promotion reached more than 100,000 consumers who visited the participating Hey_Yo outlets during the month. About 60, 000 entries to the lucky draw were received. According to Hey_Yo’s internal sales analysis, the most popular product during the promotion was cranberry yogurt. 6,000 cups were sold in the month. The second most popular item was cranberry crackers. More than 2,300 packs were sold. These two popular cranberry products have now been added to Hey-Yo regular product range. An off-line media event to announce the winners of the major prizes in the lucky draw is scheduled for October, to sustain consumers’ awareness of and likings for Hey_Yo and US Cranberry.